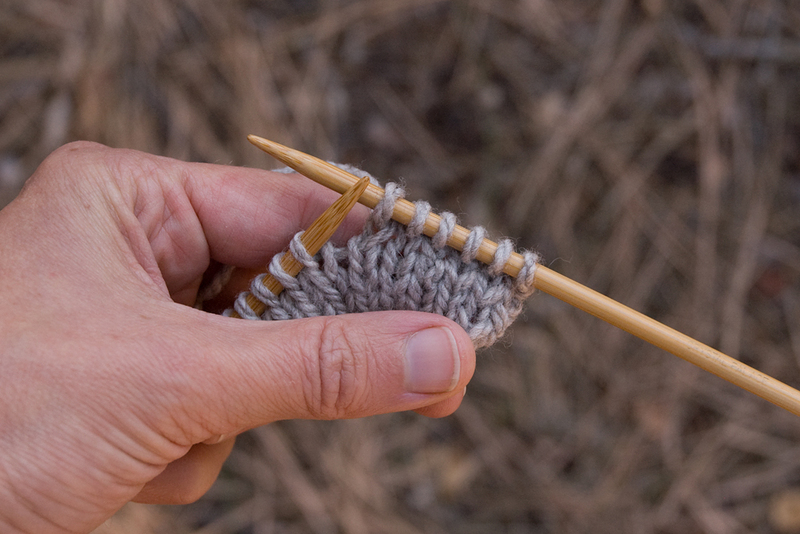 One of the things my knitting students have a lot of questions about is gauge, so I thought it would be a good topic for a post. I am helped out on the visuals here by my aunt Kathy, who gave me a lot of this yarn (thanks Kathy!). A LOT – I made all this stuff, gave 2 skeins to my friend Becca, and still have the ball you see left. It’s been interesting for me, since I would normally not make several things from the exact same yarn. 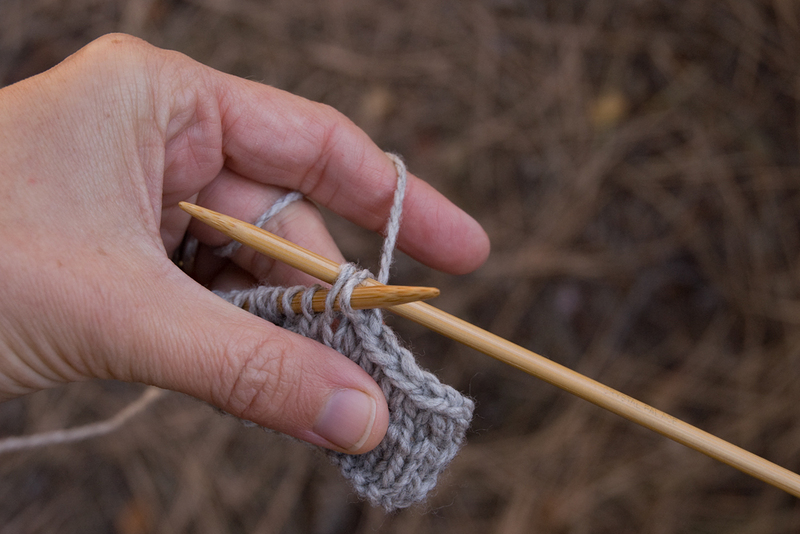 Ok, so quickly, in knitting, gauge is: how many stitches per inch you are knitting. 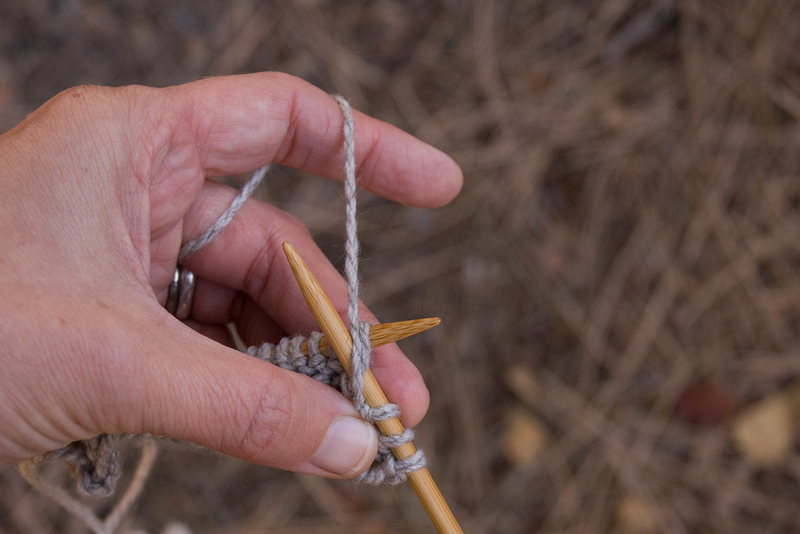 It varies with the yarn and needles you are using, and with your individual tension, how you hold the yarn, so it will not be the same as the person sitting next to you, even if you are using the exact same materials. 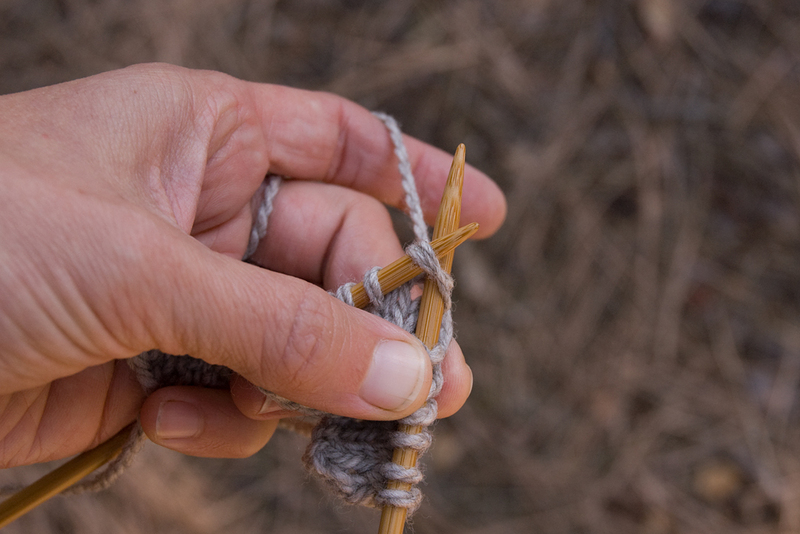 Imagine you are making a sweater. 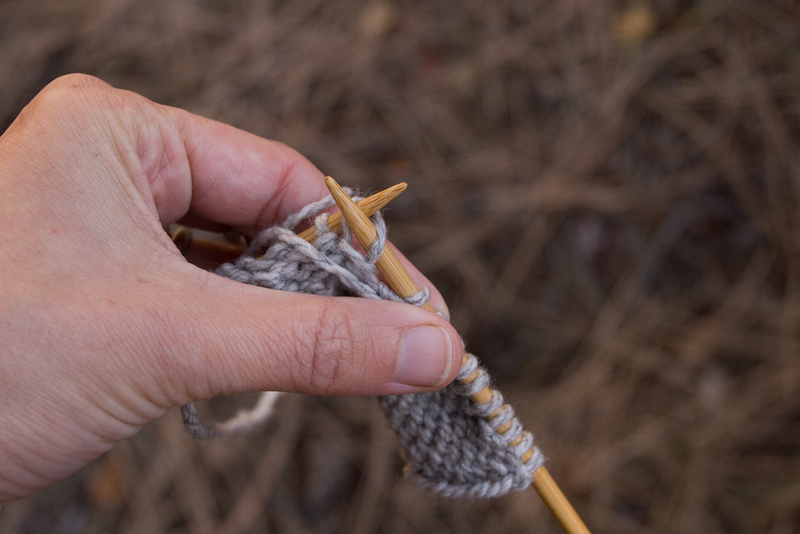 If the pattern calls for 5 stitches to the inch, but you are knitting at 4.5 sts/in (knitters love abbreviations, have you noticed?) and you multiply that by the 200 stitches you need for your sweater. What can seem like a small difference is suddenly 4″, the difference between it fits or it doesn’t. It follows that the bigger and/or more fitted the project you are making is, the more important it is to know what your gauge is going to be before you start. I nearly always make a sample square to test gauge before I start, a big one (maybe a foot square) for an important project, and a smaller one for something that’s easier to take out and start over. 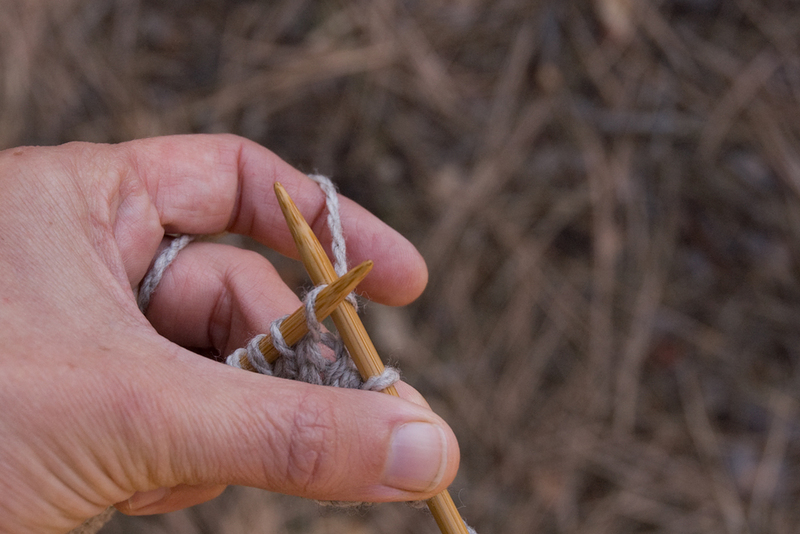 Each “V” or tiny mountain is one stitch. Line your ruler up with the starting line between two stitches. Count the stitches (it helps to have a spare needle or something else smaller than your finger to count with). If you count over more stitches you’ll get a more accurate measurement, especially if you have halves or quarter stitches in each inch, so count over 2″ or 4″ or however many you can in your sample, and then divide to get your number of stitches per inch. 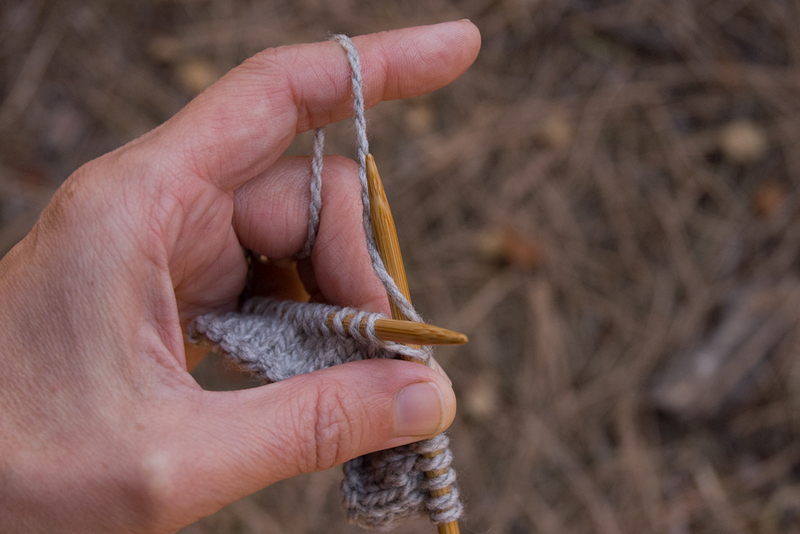 When measuring, take your sample off the needles, or slide it onto the center cable if you are using a circular needle, or bind it off if you want to keep it. You can see here how the needle is holding the stitches apart, taking the sample off changes the measurement by 1/2 stitch per inch! 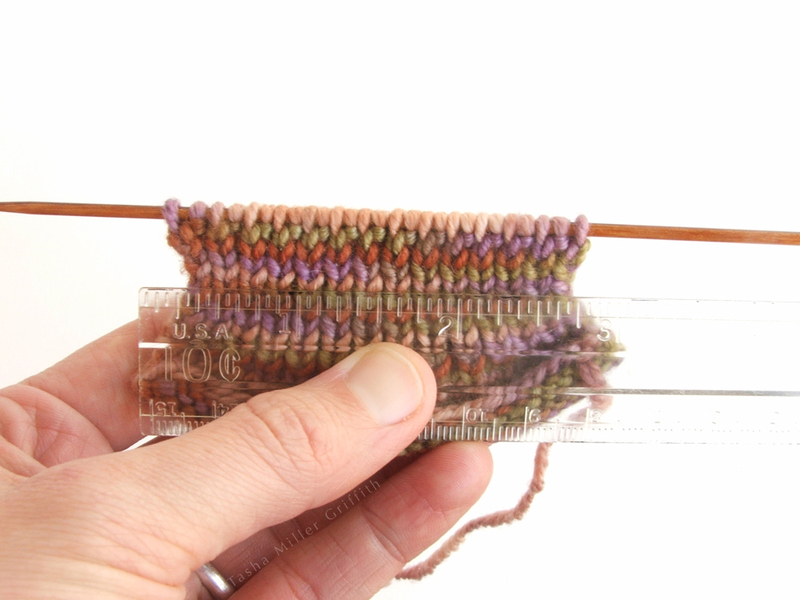 If your gauge is not the same as the gauge in your pattern, you have a couple of options. 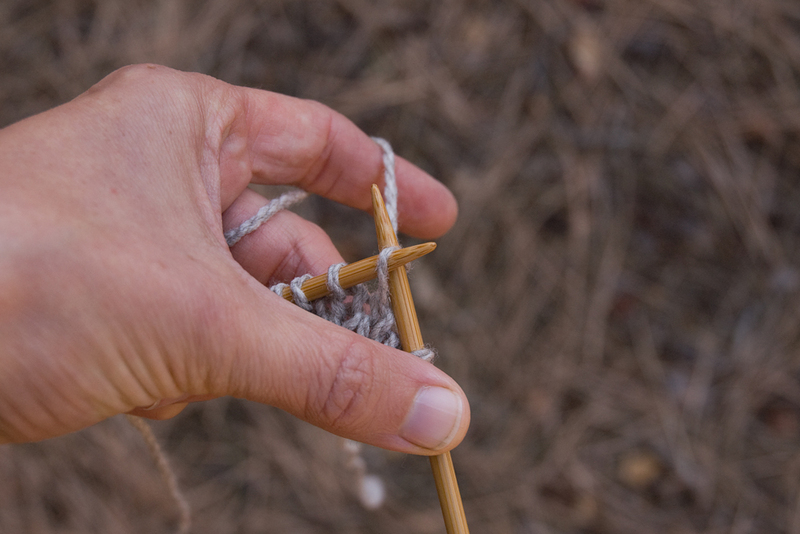 One is to try to loosen or tighten your gauge, usually by using a bigger or smaller needle. 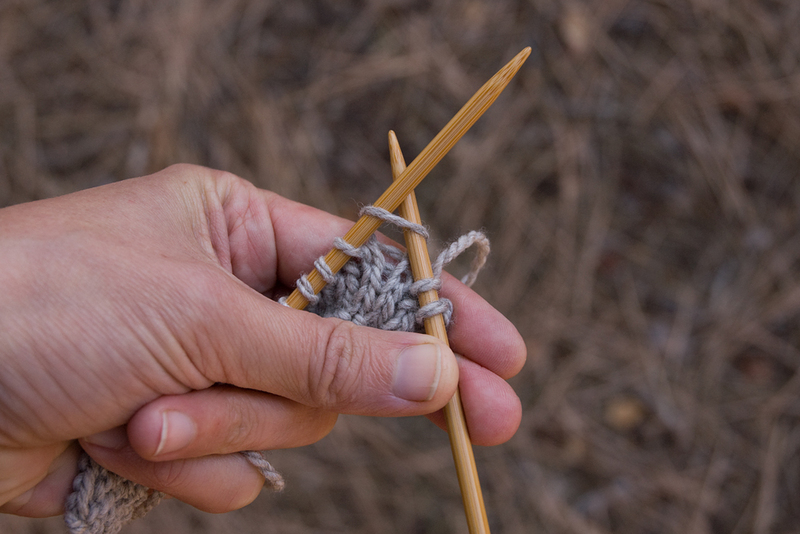 If you knit loosely, there’s a good chance this won’t work very well, but you can tighten your stitches by keeping them packed closely together on the needle as you knit each one. 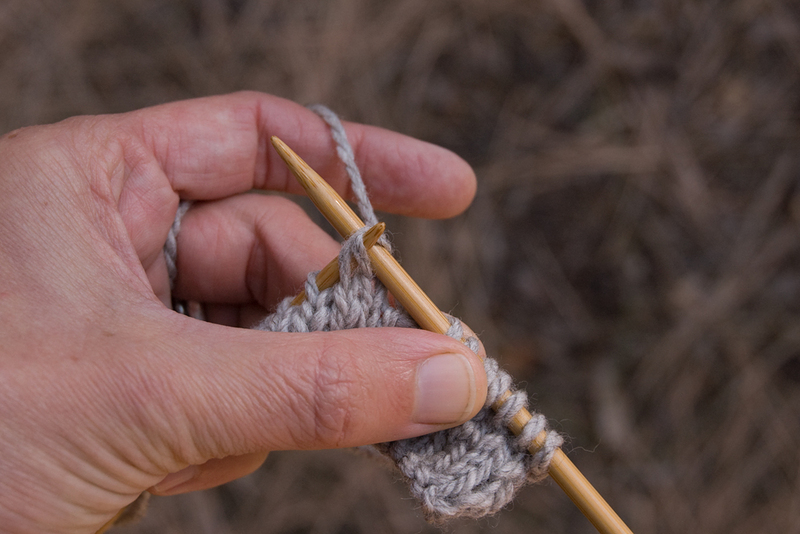 Use a finger on your right hand to keep them from spreading out, and thus using more yarn for each stitch. This fabulous tip is from Stephanie Pearl-McPhee, by way of Cat Bordhi in her amazing workshop earlier this year (Sweet Tomato Heel workshop, from whence these socks)! Your other option is to do a little more math. If you like how your sample looks and think it’s a good thickness and drape for your project, you can figure out the finished size of your project by diving the number of stitches suggested in your pattern by the suggested gauge. 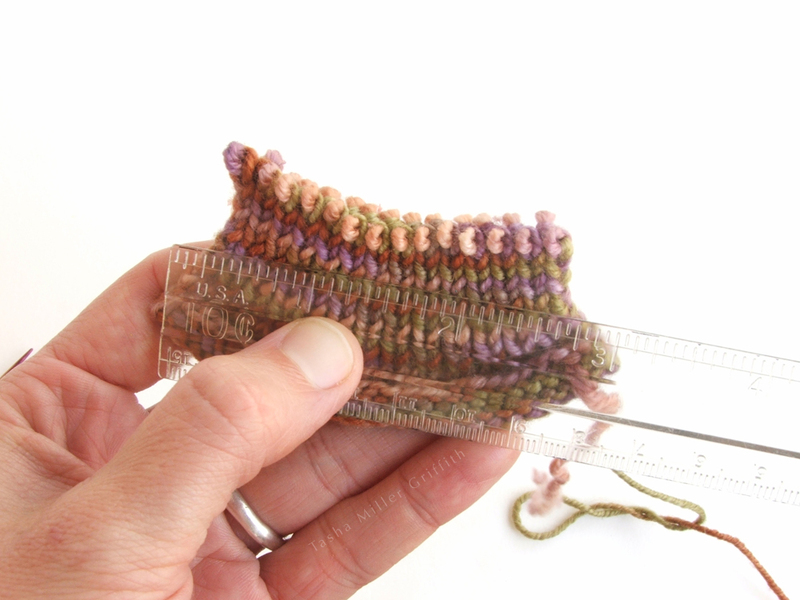 That will give you the size in inches, which you can multiply by your personal gauge to get a new total number of stitches. Be aware that if you choose this option, you may have to make more adjustments as you go, you might need more or fewer decreases, etc. 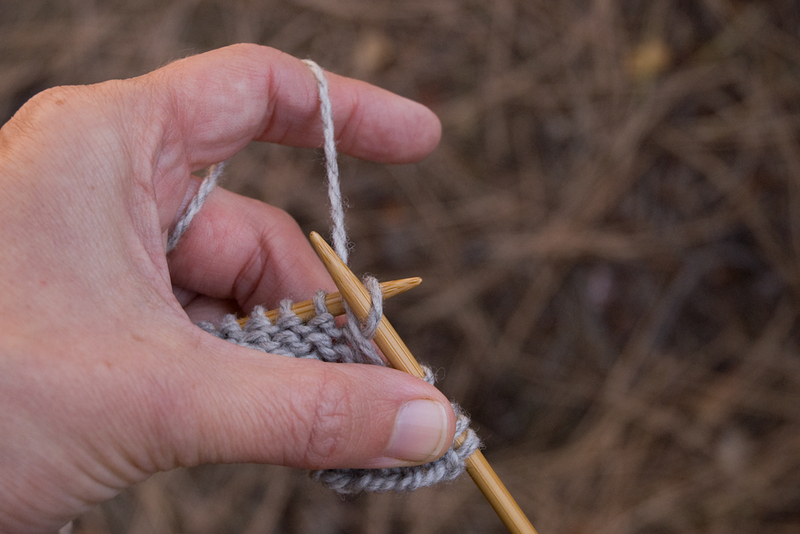 Knitting lends itself to experimentation (and taking out small sections, then trying them again) so go for it! Which leads me to my last point – gauge is all in how you see it. 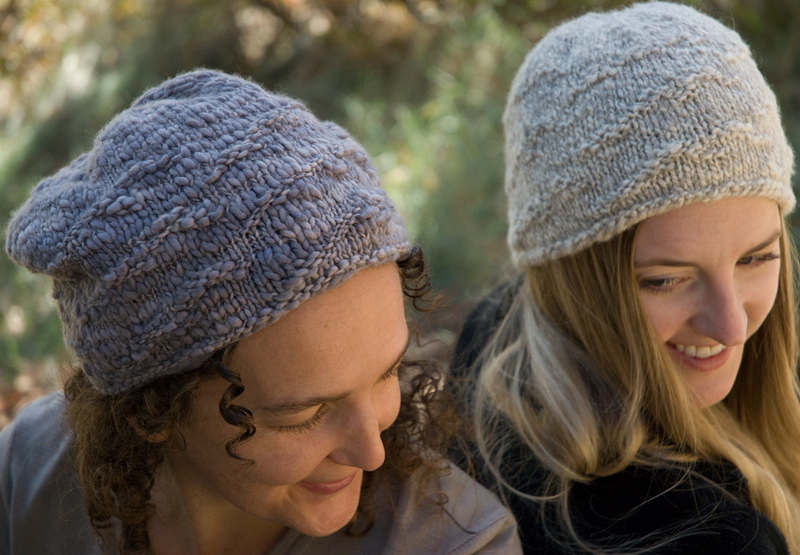 Yarns knit tighter will yield a thicker and stiffer fabric, which might be great for a cowl that stands up on your shoulders and keeps you warm. 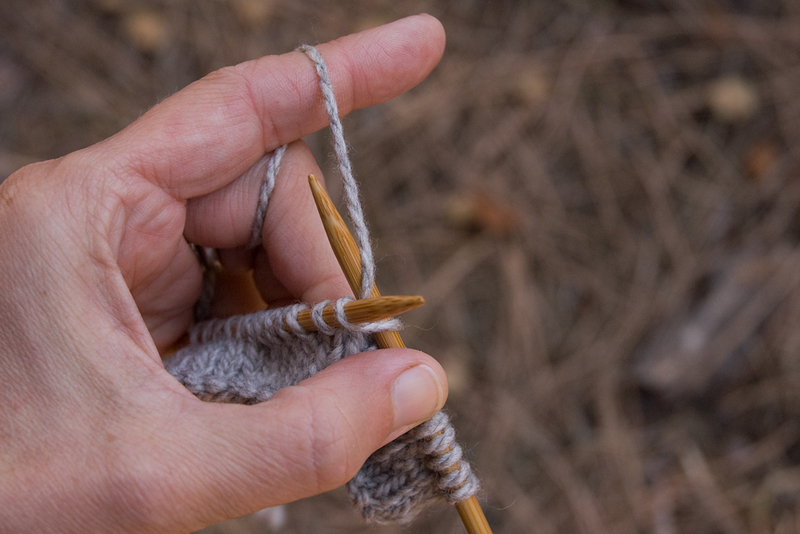 The same yarn knit much looser might make a lacy, drapey scarf. Or it might not, depending on other characteristics like the fiber and the way it was spun. Try a little bit and see! If you are interested, here is the breakdown of the things I made and their gauge. All were knit by me, the yarn is Fiesta Boomerang (100% superwash Merino, I looked it up and they still make it, although not in this colorway). 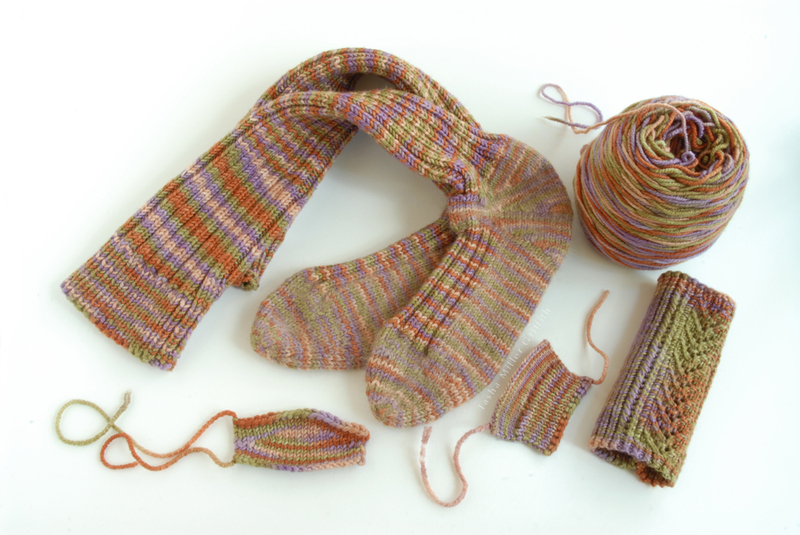 The small curved sample and the feet of the socks (which I knit along with a mohair & silk yarn, another awesome tip from Cat’s workshop) are both 5.5 – 6 sts/inch, which for my taste is about ideal for this yarn. The legs of the socks (pre-that tip about squishing the stitches together) are about 5 sts/inch, or would be if they weren’t ribbing. The tight square sample was made in preparation for the lace mitt (the tube-looking thing), the tightest I could get this yarn was 8.5 sts/in. It did make a very firm and stretchy ribbing! By the way, the gauge suggested on the label was 4.5 sts/in – I don’t know where they get those, but they are often way off what I think is reasonable. 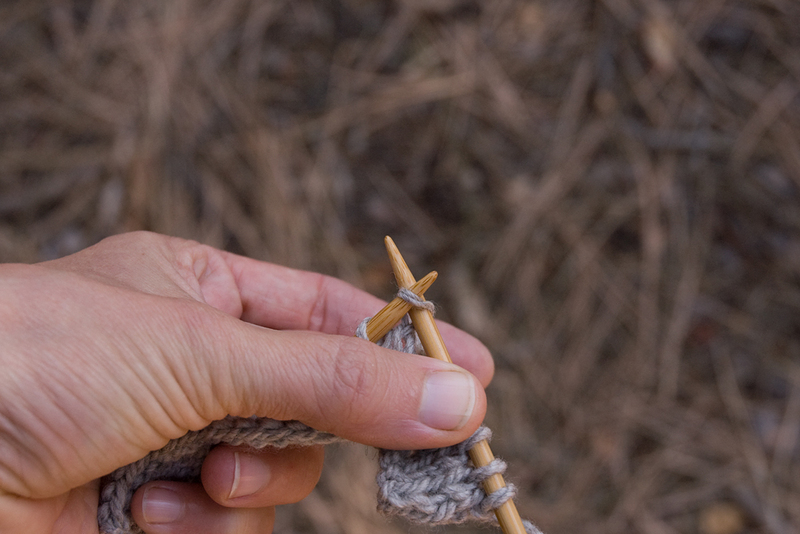 A better guide is the weight of the yarn, especially if you are looking to substitute for another yarn suggested in a pattern. If you think of anything I haven’t covered, feel free to ask!